As part of the Adult Social Care and Communities Directory, Coventry City Council is launching a new online carers self-assessment. The self-assessment will ask a series of questions designed to provide an overview of a carers circumstances and their situation. The questions will focus on the carer to gather information about their current caring role, what their needs are and how to plan for the future. The completed assessment will be considered and validated by either the Carers Trust, who are working in partnership with Coventry City Council, or a member of the Council’s carers team. Information and advice will then be provided to assist the carer in continuing to fulfil their caring role, and taking care of themselves. The assessment is available as part of the Adult Social Care and Communities Directory. This will be the second online self-support form that has been launched. The first saw the introduction of the person centred self-assessment form which allows people to complete their own self-assessment to find local support and to make a referral to speak to a member of the social work team. Access the self-assessment, along with other useful information and advice pages. One of the most difficult times for carers of people with dementia and others experiencing communication difficulties is when someone else is responsible for providing care and support. This could be in any setting, but often through a hospital admission or a respite stay. ‘This is me’ is a simple and practical tool that can help. The booklet includes space for carers to write down information about the person ranging from their background, occupations and important people (and pets) to their likes, dislikes, interests, preferences and routines. This document can travel with the person into any setting and gives professional carers a better understanding of the individual and enables them to tailor care specifically to the person's needs. This can help to reduce distress and reduce risks around people not eating and drinking well. 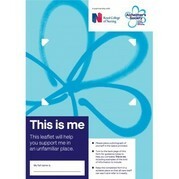 There are other similar documents available, for example, University Hospital Coventry and Warwickshire staff use a ‘Forget-me-not – getting to know me’ form for the same purpose if a ‘This is me’ form hasn’t already been prepared. The document is available to download from the Alzheimer’s Society website -This is Me and the Coventry office have some paper copies available too. The City Council’s People Directorate will be advertising shortly for a Carer’s Assessment Worker to work in Adult Social Care. This full time permanent post sits within the Council’s older people’s services, however, they will offer support to colleagues in the All Age Disability and Mental Health teams. Thursday 9 November will be the date for the Coventry Safeguarding Adults Board Conference ‘Safeguarding at the heart of everything we do’. The event will be held at the Welcome Centre, Parkside, Coventry. Guest speakers will include Lyn Romeo Chief Social Worker for Adults who will be talking about the impact of the Care Act 2014 on Adult Safeguarding. Look out for further details and booking arrangements. Proud staff at three care homes in Coventry are amongst the first to receive dual accreditation in both the React to Red Skin campaign and Infection Control certificates. ​​The work is helping to significantly reduce avoidable pressure ulcers and improve care across the Coventry area. The Weavers, Cordelia Court and Sovereign House care homes each took part in a new ‘React to Red Skin’ training course, implemented by the Council, NHS Coventry and Rugby Clinical Commissioning Group (CCG), and national charity Your Turn. The training seeks to educate staff on how to spot the signs of pressure ulcers, and has resulted in no new avoidable pressure ulcers being diagnosed since its inception.